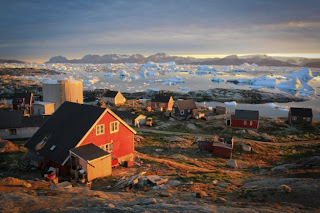 In all of East Greenland, there are only 7 settlements. They are: Kulusuk, Tasiilaq, Isertoq, Tiniteqilaq, Kuummiut, Sermiligaq and finally Ittorqqortoormiit in Scoresby Sund 600 kms to the north. The first 6 settlements all lie south of the Arctic Circle and total a population of 2665 as of 2010. 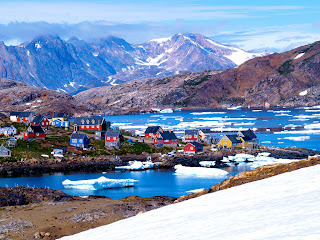 Tasiilaq (formerly Ammassalik or Angmagsalik) is by far the biggest settlement with 1930 people living in it. Kulusuk (formerly Kap Dan) is where the main East Greenland airport is located and where I will enter Greenland. It is a small picturesque settlement with 286 people. 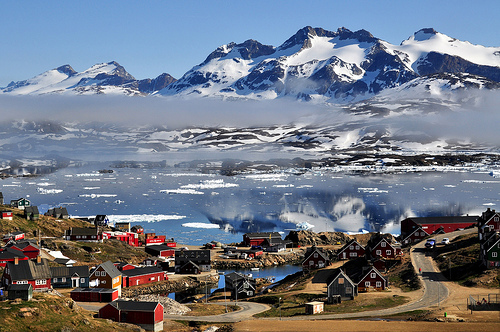 Isertoq is an isolated settlement to the South East of Ammassalik Island with a population of only 93 people. Tiniteqilaq, on the edge of the stunning Sermilik Fjord, has a population of 134. It appears that these Eastern settlements maintain a far more traditional way of life compared to Western Greenland which has been heavily influenced by Danish culture. Europeans arrived in the Ammassalik area only around 120 years ago. Contact was made very late due to the difficulty of navigating these waters with only a relatively small window of ice free conditions. Compare this to the settlement of South Greenland by Eric the Red and his Viking countrymen. Eric the Red first landed in Greenland in 982 AD and by 1000 AD there were some 3,000 people living in 300 to 400 farms.